According to the pie-chart below, the average asset allocation for respondents with over $3 million in investable assets is 55% stocks, 21% bonds, 15% cash, 6% alternatives, and 4% other. What's more interesting is the breakdown between generations. Equity portion has increased for both Gen Xers and Millenials from 25% in 2017 to 46% in 2018 for Millenials, and 45% in 2017 to 54% in 2018 for Gen Xers. Wonder how much of that is an actual decision to invest more, or just the effect of a very positive stock market year on what are likely smaller portfolios than the two older generations (Boomers and Silent Generation) and a sort of unintentional portfolio slip. After a great 2017, it’s understandable that most generations increased their stock allocation. If you’re a Millennial, you’ve mostly seen good times since 2010. Even though you may have graduated college during the recession, you had no money to invest for the first two years anyway. Now that Millennials are entering stronger earning years and are better educated about the benefits of long-term investing, the trend towards higher stock allocation should continue. Granted this is a blog post not an academic article, but I disagree with the bolded statement, however think the author is probably correct with his next statement. Millenials are probably entering peak earning years. Rather than say the stock market has been fantastic, it's important to point out the labor market has not. So many Millenials might just be getting on their feet and getting good jobs right now. But as for me, a millenial, I did have a 401k in 2007 and remember vividly the downturn. Sure it wasn't a balance anyone on here would brag about, but at that time that was the most money I'd ever scrounged together. I suppose that's sort of the problem with the generational markers, many millenials weren't working yet, though there is plenty the generation has in common (bad job market, rapidly increasing tuition/rent, student loans). They still have the largest cash allocation, which shows a generation that still feels burned by the financial markets. For me, the biggest surprise really is how those ages 73+ have a 61% allocation towards stocks. 73+-year-olds have seen it all, yet they are still undeterred. This is very insightful because it seems experience has taught them that staying the course long term is the way to go despite the stock market being at close to record highs today. To them, long-term investing has been proven correct. 60/40 seems a pretty common ratio once someone hits retirement, so I'm not too surprised at the numbers. Also, AARP says more than half of folks in their 70s have some type of pension. So some type of pension + social security, makes sense to me they would be able to tolerate downturns. It probably has little to do with all they've been through and more to do than many might be trying to grow their nest egg for heirs rather than themselves. Curious what others take on this is, did it surprise you or in line with what you thought? Not sure what correlation the article is trying to draw and if there's any distinction between "High Net Worth >3mil" or others. But it does reinforce the 60/40 allocation as a solid baseline for many. Outstanding write up on the 64/40 allocation by Bernstein. The author refers to the equity portion as the "business component". Hmmm. I think there would be more distinction with large pensions and those without - than there is between those with net worth over $3 million and those of say $1 million. As in most portfolio evals., the variance is in the nature and diversity of income stream in retirement vs size of total assets. Actually, there is academic research showing that Millennials may be the most conservative generation since their great-grandparents, who went through the Great Depression. Being automatically placed into target-date funds, which are mostly stocks at this point for them, may be their only 'saving grace'. Agreed. Another win for the concept of target dated funds in retirement accounts. How this is NOT the default in every workplace retirement plan in beyond me. That is interesting to know, but the thread is about the asset allocation used by high net worth investors. Well, I read the article and it pegged my BS detector way over on the deep red "Man the Lifeboats" side of the scale. Not surprisingly, since it is put out by the Private Wealth Management arm of Bank of America, either they are ignoring real estate, or it is in that 4% "other" category. In my lifetime, I have personally known (not just met in passing) at least 6 of the HNW individuals they talk about and one UHNW individual. The UHNW guy was a business owner, the other 6 had healthy amount of both stocks and real estate outside of their primary residence. Sure, this was a limited sample, but the odds on meeting 6 out of 7 people who are in that category and have at least 50% real estate instead of 4% are slim to none. And the 7th, the UHNW individual still had much more than 4% of his net worth in real estate. My take on it is that "the Private Wealth Management arm of Bank of America" advises people on stocks and bonds, but does not have anyone on staff who is a real estate broker. ...there are 4,665,039 households in America with net worth of $3M or more. If that is true, then the sampling size of 892 barely even registers. Extrapolating asset allocation from such a small sample size for such a large group doesn't seem to warrant more than a glance. Financial Samurai has written many similar articles in the past. I recall one where he said $3M is the new $1M in terms of being a millionaire compared to prior generations' thoughts of that status. So using the "target" of $3M for the particular article linked above seems to coincide with that premise. The most popular answer by his readers who voted was $5M. Again, he runs lots of articles, opinions, thoughts, polls on various wealth levels that may be interesting to glance at, but I don't get much more out of it than a curious glance. there are 4,665,039 households in America with net worth of $3M or more. If that is true, then the sampling size of 892 barely even registers. Extrapolating asset allocation from such a small sample size for such a large group doesn't seem to warrant more than a glance. It depends significantly on the sampling method being used. If simple random sampling, the 'gold standard', were used, a sample size of 892 is actually quite powerful. Nearly all samples are more or less capped at around an N of 1,000 because the marginal benefit of going up from there is small. For instance, with simple random sampling, an N = 1,000 translates to a margin of error of +/- 3%. To get that margin of error down to +/- 1%, you need a sample size of about 6,500. Where the rub comes into play is when something other than a probabilistic sampling method is used. In truth, non-probabilistic sampling methods are far more common with real people because we seldom have a list of all of the people in our target population, a requirement for a probabilistic sampling method to be used. They are less powerful than probabilistic sampling methods, but precisely how much less powerful a given sample is is unknown. The results may be close to that of a probabilistic method or not. But even so, a sample size of 892 is very decent even if a non-probabilistic sampling method was used, significantly larger than what is commonly used in the social sciences, and particularly if the sampling methods were decent otherwise. The point is that you don't need to sample X% of a population in order to have a good sample. The parameters of a population with 1,000,000,000,000 elements in it can be estimated surprisingly well with a simple random sample of just 1,000 elements or fewer, depending on the margin of error you're comfortable with. The only problem being they charge $9000.00 per report. Market research, whether it's good or bad, is not usually cheap. That's actually a fairly typical amount for a sector report. If you polled the people who actually have $5 million, I bet they would say $10 million. If you've stayed the course I don't see why you would need to go lower than 60/40 in retirement. Most of these types of people at $3MM or more at 65+ years of age are in estate mode rather than worrying that they will spend down their assets. Yes, we could have another depression but your asset allocation isn't going to matter much because your younger heirs will probably not have jobs and being the most conservative at 40/60 instead of 70/30 or whatever isn't going to make a big difference in your quality of life or that of your children and grandchildren. A 60/40 portfolio on $3M in a 50% equity downturn would likely not even lose $1M as bonds would likely go up? I personally don't really see a 65+ year old who's seen the market the last 40 years and stayed the course as losing their minds over this with a $3M net worth. You may even be able to swing less than a million down on a 70/30 in this situation. I'm sure someone can back test Oct 2007-March 2009 on $3M at 70/30. This of course doesn't analyze SS or pensions. 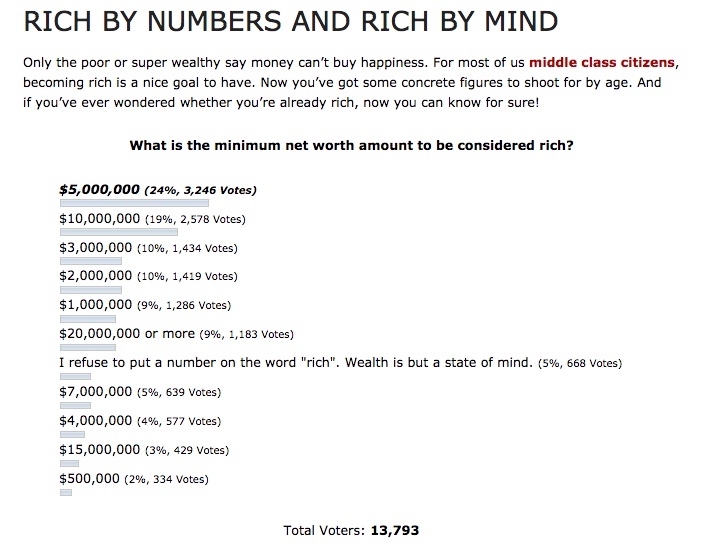 That chart is interesting in that 11% of the population thinks $1M is "rich"
One of life's greatest ironies, IMHO, is that people want to have money in order to spend it. But in order to have money, one cannot spend it. Most people don't want $5,000,000 in order to possess it; they want it in order to spend it (e.g. most lottery winners, celebrities, and pro athletes). And once they spend it, they'll likely be less happy (and possibly less financially secure) than they were when they started. This is probably also why people so often view wealth in terms of income instead of assets. i guess i can add another data point as an "HNW" Genexer. Currently at 62% stock, 22% bond, 16% cash. Zero "alternatives". Toying with early retirement, and i haven't been buying bonds for the past few years, so I am more cash heavy than in the past. My plan is to stay around 60-65% stock going forward. Most people don't want $5,000,000 in order to possess it; they want it in order to spend it (e.g. most lottery winners, celebrities, and pro athletes). I can't imagine wanting to spend $5M. What would one even spend it all on? And then, once you bought something, you'd still have to maintain it, which is going to cost you even more money---so what's the point of buying said something in the first place? As to the OP or what allocations high net worth people have, it seems to me that the higher your net worth, the more likely it is that you'd care about keeping your money than making/earning more of it, so a stock allocation in the 30% to 60% range would seem commonplace to me. But what do I know? That's could be argued to be 'borrowing' rather than 'spending'. You could easily spend that much just on a small private island. And my statement is more applicable to non-Bogleheads as well. I would venture that most here view wealth in terms of "net worth", whereas many others view "high income" as wealthy, on a day to day basis. IE: High earners (usually also high spenders). Also, that how a person accumulates $3-5 million dollars, whether earned $1 at a time or windfall, etc, has a lot to do with their perception of wealth and how easily disposed it might be. Last edited by Sandtrap on Thu Jul 12, 2018 4:49 pm, edited 1 time in total. One of life's greatest ironies, IMHO, is that people want to have money in order to spend it. With me, it has a lot to do with security. Yes, I agree. Many, perhaps most, non-Bogleheads seem to me to want the ability to spend, spend, spend, and they view a high income as an easier and faster way to achieve this than high net worth. That perspective can remain for a long time, perhaps even most of one's life, until the person realizes that if a high income requires them trading their work/time/abilities for money, they may no longer be able to make that trade. Ditto that for me as well. That's partly why we're Bogleheads. Of course, one could argue that security can only be achieved through the ability to spend that money, but that might make my statement a truism. This study was recently posted but for the life of me I can't find the thread. Exactly, I view it as a Scrooge-like illness to aspire to be the richest man in the graveyard. Even if you have a bequest motive, whether heirs or charity, those beneficiaries might benefit from receiving some of the money now, instead of waiting for an event decades in the future.